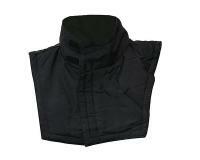 Black neck warmer with velcro to secure in the wet cold season, the neck from the cold wind. Stay Warm as you ride your Vespa in any weather. The perfect gift for any scooter lover in your life. Stay warm and avoid the chill with an S-Line Neck Warmer.